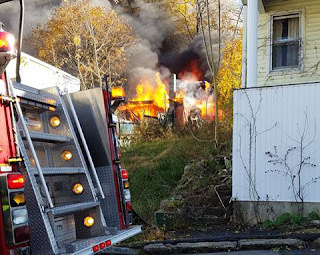 Fire crews are at the scene of a fully involved fire in Pottsville. Just after 1:00pm, emergency personnel were called to 233 Pierce Street, Pottsville, for a working structure fire. Early reports were one burn victim has been taken from the scene and one other person was unaccounted for. Both have not been confirmed by authorities. We will have more information as it comes available. Photo Submitted by Joe Carson Jr.